Blueprint Mental Health is New Jersey’s premier mental health practice located in the heart of beautiful downtown Somerville. Specializing in children, teens and young adults, (from about 6ish to about 30ish years old) Blueprint provides the absolute highest quality of clinical care to those struggling with such obstacles as depression, anxiety and family conflict. We are a young, yet experienced group of therapists who pride ourselves on truly connecting with and challenging our clients through a proactive approach to counseling. 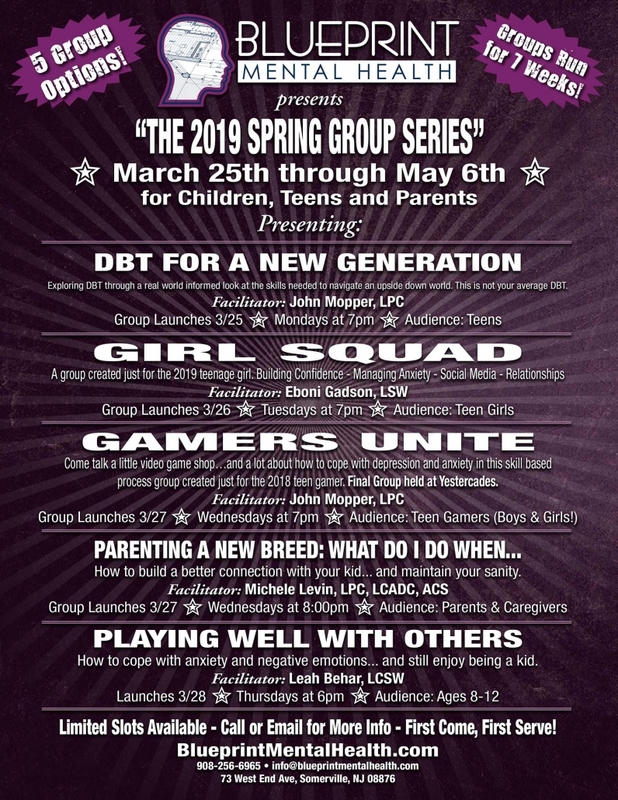 Blueprint Mental Health is excited to announce the launch of our 2019 Spring Group Series! This time around, we have a choice of 5 different groups and have added Gamers UNITE to the roster. Group counseling is a great addition to individual counseling or can be cool all by itself. Come meet some other people in similar situations as you, practice some skills and maybe have a little fun. Don’t procrastinate though…registration is on a first come, first serve basis and groups tend to fill up.